How many folders do you have on your computer? Scores of them? Hundreds? Thousands? Are all of them are alike: yellow folder, yellow folder, yellow folder, yellow folder... It's so easy to be confused with such a routine! Folder Marker is your small assistant, an ardent fighter for your convenience and comfort in any kind of computer work. Use Folder Marker to mark your folders. One mouse-click and it becomes clear at once which documents have a high priority, and which of them have a normal or low priority. It is easy to see which operations have been finished completely, which are partly done and which haven't been started yet. Do you fear that someone might unintentionally delete information necessary to you? Mark a folder, and other users will notice at once that that folder contains important information. 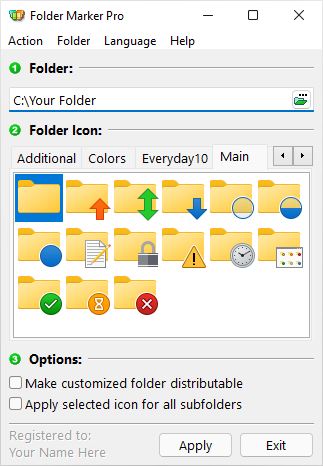 By allowing you to change the folder icons, Folder Marker will help you to cope with the standard yellowness. Folder Marker adds an item "Mark Folder" in the folder popup menu. Changing a folder icon is now a piece of cake. Folder Marker is for anyone who wants to make working with a computer more convenient. Folder Marker is for you. Download Folder Marker now! Folder Marker can mark folders by priority (high, normal, low), by degree of work complete (done, half-done, planned), by work status (approved, rejected, pending) or by the type of the information contained in a folder (work files, important files, temp files, private files). Folder Marker Folder Marker can change a folder's entire color (or shade of color - light or dark) any time you like! Your choice! Folder Marker is integrated into your Windows Explorer! Right-click on any folder and Folder Marker is instantly ready to go to work changing your folder's appearance. It couldn't be easier! With Folder Marker you also have two additional options for folder icon changes: "Make customized folder distributable" (portable) and "Apply selected icon to all subfolders"
Folder Marker contains a User Icons tab. Add your favorite icons and mark folders with them. It's easy! And what's more - Folder Marker has a FREE edition with basic functions!